We just celebrated Reggae Night XV at The Hollywood Bowl, and I’m happy to report that I have perfect attendance to this beautiful Los Angeles Summer tradition. I LOVE it. 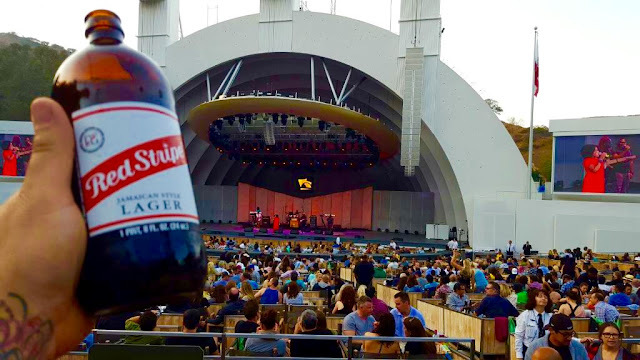 Everyone coming together, feeling Irie … it’s a perfect night every time. 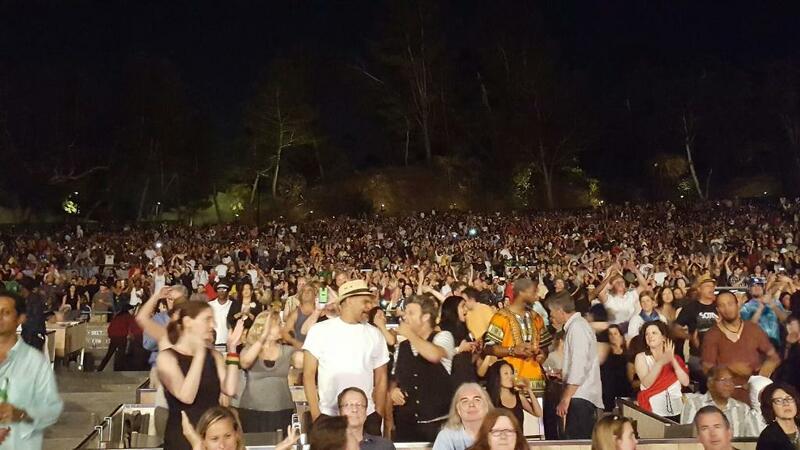 The weather was a delight, and all the Bowl patrons streaming in with their picnic baskets were FEELING it. Almost every person there had something on in red, green, and gold as it seemed that everyone in attendance was an honorary Rastafarian for the evening. This show really is all about One Love, as people laugh and share and generally have the best time ever. We had a box this time, and I was happy to see that even the folks in the good seats were getting down this time – which may have been helped along by the gigantic Red Stripes the waiters were delivering. My favorite. 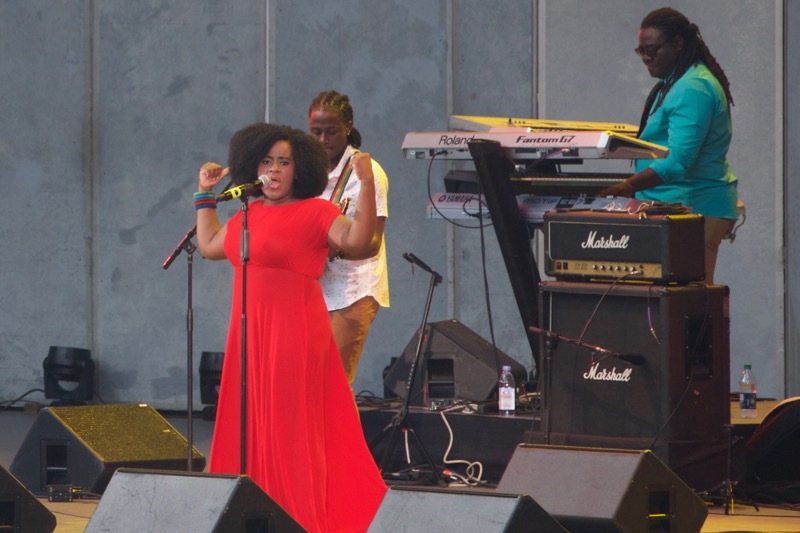 The show opened with a lively set by Etana, a gorgeous Jamaican woman with a great voice and excellent band. 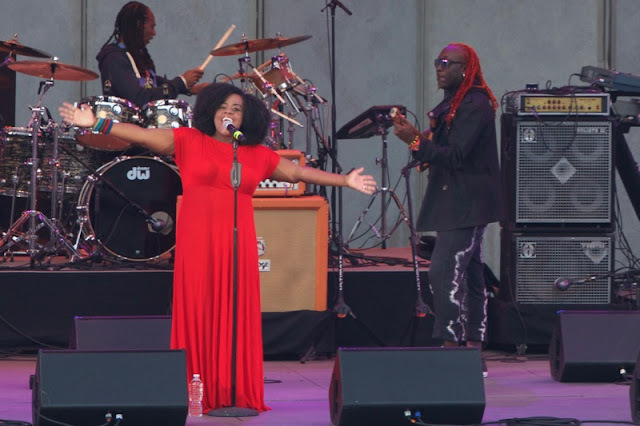 She came out in a bright red dress, and had the crowd moving along with her in no time flat. 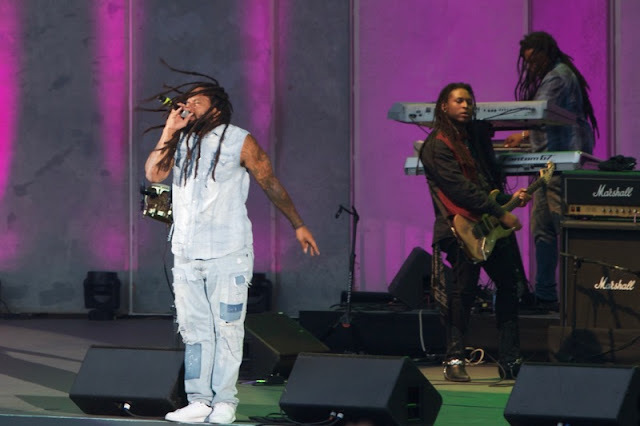 They did a song called “Reggae” and Etana educated us that in reggae, “the bass line goes with the waist line,” and showed us how to move our hips for the Rude Boys in the Dancehall. We got it. This was my first time seeing Etana, but even when you don’t know a reggae band’s own music, they always come up with some classics that get the crowd in there with them, and “No, No, No” did that trick for them. Babies were dancing in the aisles, game old people were being helped up the stairs to rock in their seats, and everyone in between was up and dancing. People watching at Reggae Night is spectacular, and one could have a good time with that alone, but it is always so much more. “Do not walk with fear … with all that’s going on in the world, find the strength to sing, NO, I’m not afraid!”, urged Etana, as they lit into their song, “I’m Not Afraid”. We all sang along to the chorus, and I think we all really needed to say, feel, and do that – together last night, but really, all the time. Thank you for that, Etana. Truly. More good people watching during the break, and yes, there were several in the house wearing those knitted tams with yarn dreadlocks attached, in case you were wondering. When else would you wear it?! Chatting and snacking resumed until it was time for Kymani Marley to take the state. This was also my first time seeing this Marley, and he did not disappoint. In fact, he might be the one that sounds the most like Bob. A HELLA lot like Bob, which is trippy considering he was only 5 when his father passed away. 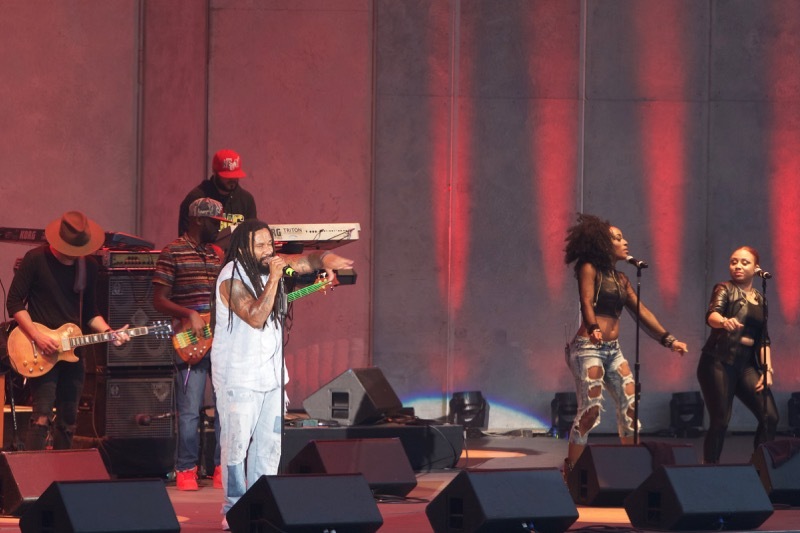 Marley kicked things off with his dad’s “Concrete Jungle”, again getting the crowd on his side right away with one they knew. After that, the answer to his question, “Are you feeling Irie? 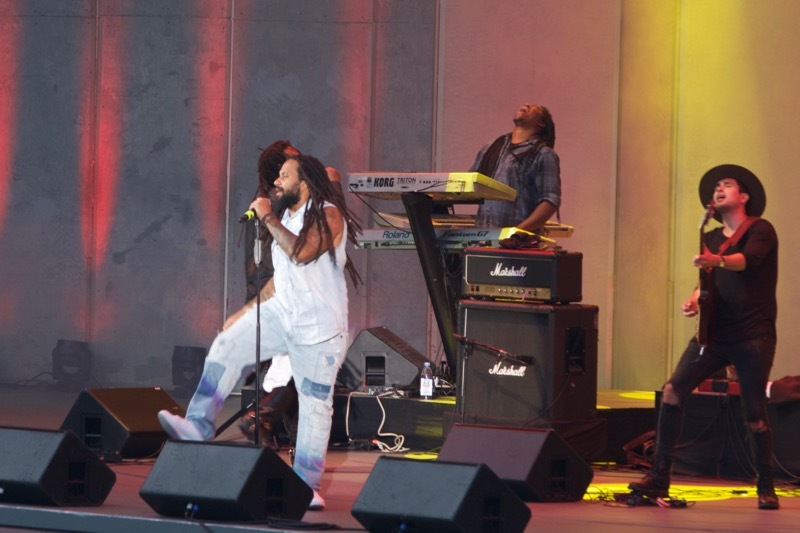 !” was an “Absolutely!” Marley introduced a new one of his, “Love Over All” and implored us all to really do that. That we NEED to put Love over all, and really, truly love your neighbor. Once again, I think this night was exactly what we needed, with how scary and negative the world seems to be these days (if you’re watching mainstream media, which I try to avoid). It was beautiful. Marley then switched up the set list a bit and threw out another new one called, “Hey”, that was all slow and cool and lit up blue. Kymani is clearly an excellent songwriter in his own right. It was lit up again next when Marley brought out his friend, Sammy Wilk, to share verses on one called “Light Up” – which is exactly what just about the whole Bowl seemed to do at that moment. A cloud of smoke enveloped the stage, and every little ting was alright. There seemed to be a time crunch, so Marley followed that up with the one-two slam-bang finish of back to back “Is This Love” on into “Redemption Song”, that, of course, everyone sang along with at the top of their lungs. Marley shouted, “Thank you so much for a beautiful moment for me, in one of my favorite places to be! Rastafari! !” And with that, he left the stage to thunderous applause and ear-splitting whistles (me). 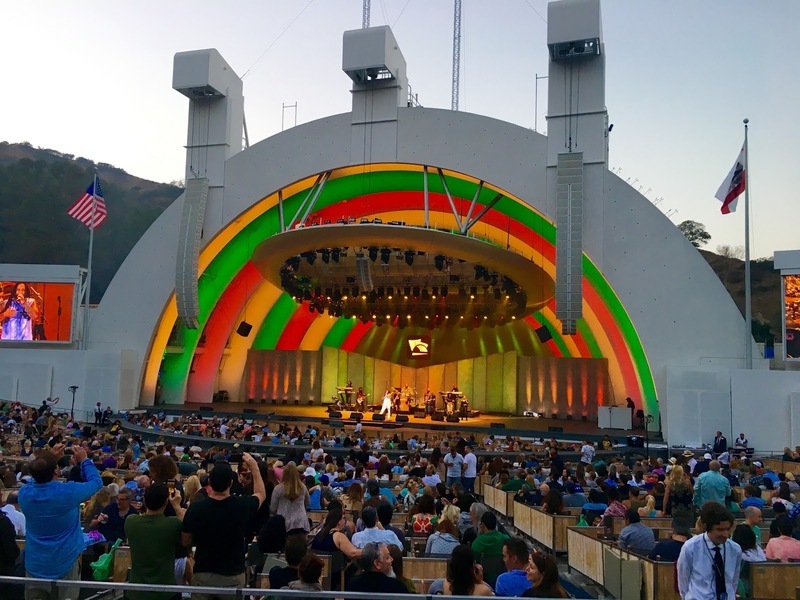 The sun had now set over the gorgeous Bowl audience, and the bandshell was lit up in majestic hues in preparation for the legend, Burning Spear. 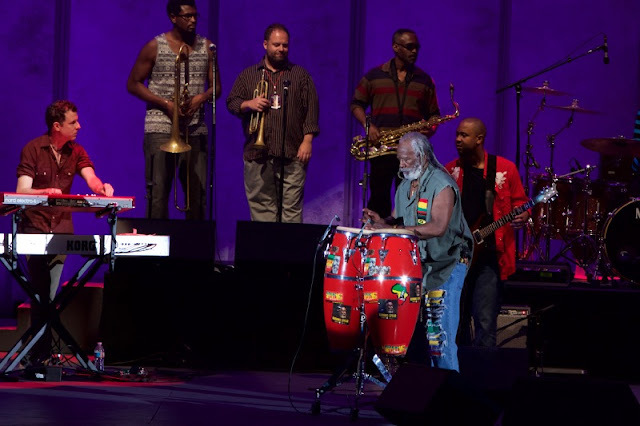 His band came on and played a little medley of instrumentals, then Burning Spear walked slowly on stage to a standing ovation. 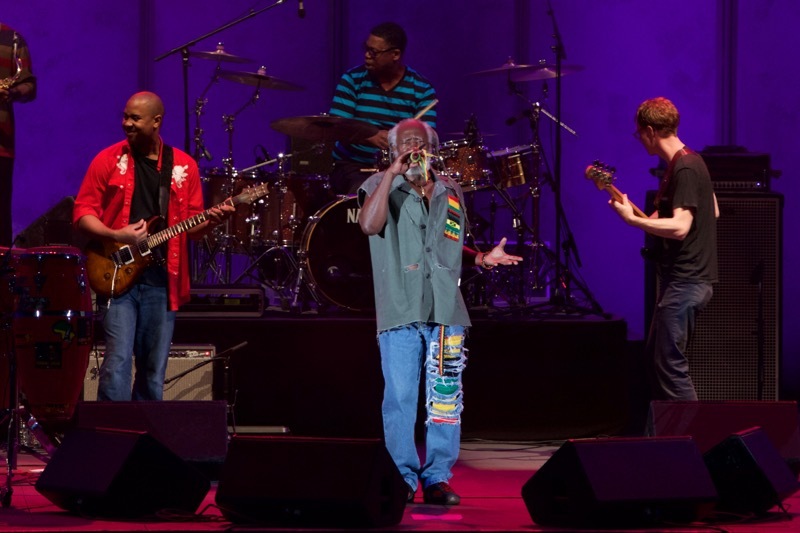 Spear is in his 70’s, but looks as hip as any dancehall rude boy could. 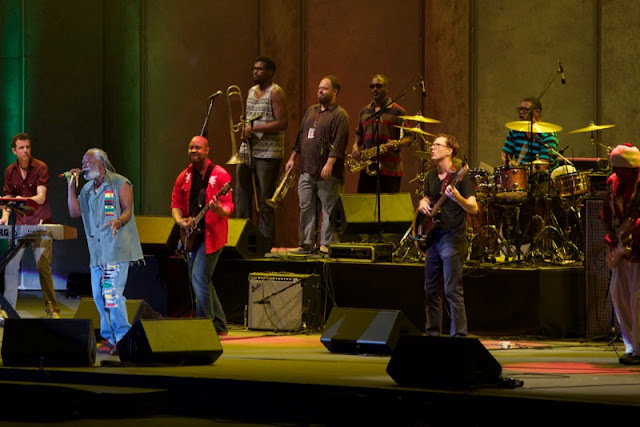 Ripped jeans, rasta military vest, long grey dreads, rasta colored microphone … Burning Spear is straight up cool. “TALK to me, People!” he would repeatedly urge, and got rewarded every time with massive crowd response. Spear tore through a lively set, high-stepping and banging on his bongos like a man a third of his age. 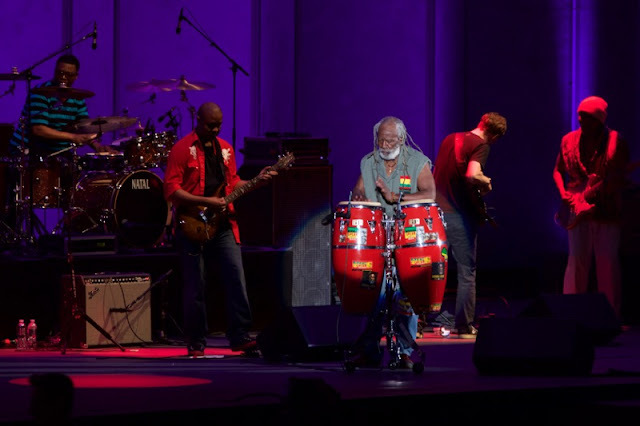 Each bongo solo was met with a roar from the crowd, and each dance move was applauded like it was his last – because, in fact, it was the very last performance for Burning Spear in California. I guess the travel is getting to be too much for him, so he made the decision to wrap up touring here. This gave the evening a special patina, knowing that it would not happen again here in this beautiful place. “Jan No Dead” is always one of my favorites, and when Spear sang it, it was reassuring. From his wise eyes that you can tell have seen it all, to his very strong voice, he did a great job of convincing us that all is not lost. “Do you want some more ORIGINAL reggae music? !” Yes, Sir. We did! Spear kept stressing original, not only the truth that he’s an elder statesman of the genre, but telling us all to STAY Original. This was well-timed, as I’d just been having the conversation about how I can’t stand slang when it catches on, and if I hear one more person say “Squad goals/That _______ Tho/I can’t/ or any of that drivel … UGH. So, please … heed Burning Spear, and STAY ORIGINAL! Please forgive the digression – I had to. “From 1969, the Spear has been burning until this time!” That was almost drowned out by the applause, and you could tangibly feel the respect in the air. After lively versions of “Tumble Down” and “Red, Green, and Gold”, Spear walked slowly off the stage, and the place went crazy screaming for more. That went on for a few minutes, then Spear and the band returned, saying, “SHOUT it if you want to hear more ORIGINAL reggae music!” Which we absolutely did, and shouted for. I was not prepared for him to start singing, “Purple Rain”, and tears instantly sprang to my eyes. It was a slow, melancholy version, and knowing that it would be Spear’s last time here made it all the more emotional (plus it was my first live Prince cover since he passed away). It was beautiful as we all sang along, and Spear said that one thing he admired so much about Prince was that he always stood up for what he believed in, with confidence. “In my own way, I salute Prince,” said Spear as he began his best song, “Slavery Days”. It was heavy truth, delivered by a master at the twilight of his career, making us all know and appreciate that what we were seeing and hearing was something special indeed. “Holy Foundation” was likewise heavy, and as Spear stretched out his hands to the audience, it looked like he might cry. I know I did. 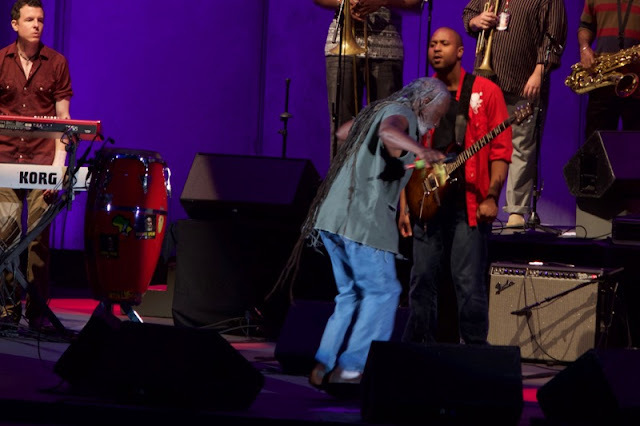 “It’s my last performance in California … I know you will always remember Burning Spear, and keep his music alive!” And that was that. Burning Spear left the stage, but with the outpouring of love and admiration that followed, he may rest assured that he will never be forgotten. What a beautiful time Reggae Night was once again. I’m so grateful to the Hollywood Bowl and everyone involved for the gift that they give to us in Los Angeles each Summer with this wonderful program. Hope to see you at Reggae Night XVI! One Love!